NotePager Pro is a sophisticated desktop wireless messaging application. It is capable of delivering messages to an unlimited number of recipients (mobile phones, PIMs,pagers, etc.) and/or groups. NotePager Pro includes advanced features such as scheduled messages, repeating messages, pre-programmed messages, on-call groups, etc. 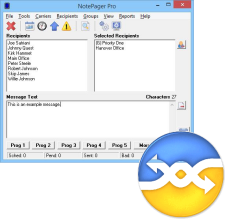 NotePager Pro supports all of the current text messaging protocols (FAX, GSMAT, SMTP, SNPP, TAP, TONE, UCP, and WCTP). All of NotePager Pro's features are containded within an easy-to-use and intuative graphical interface. PageGate is a high-end messaging gateway that allows for network sending of SMS messages from any combination of the following modules: web, email, command line / ASCII, serial, TAP, SNPP, touchtone, windows GUI client and a filter pack. PageGate is a powerful, scaleable network gateway for sending SMS or text messages to mobile phones, pagers or other wireless devices. Numerous delivery options, include Internet delivery, modem dial out or direct connections to telecom terminals. Wireless modems, in general, are an excellent option for message delivery. They simplify setup, reduce the administration requirements, improve the reliability of PageGate and NotePager Pro. 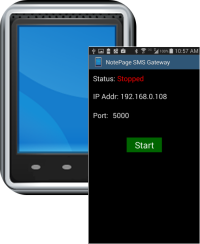 Now any Android phone can be used as a wireless modem with PageGate and NotePager Pro. PageGate Platinum is a robust high-end text messaging gateway that allows for network sending of SMS messages from all of the following modules: web, email, commandline/ascii, serial, TAP-in, SNPP and touchtone and windows GUI client. PageGate is a powerful, network gateway for sending SMS or text messages to mobile phones, pagers or other wireless devices. Numerous delivery options, include Internet delivery, modem dial out or direct connections to paging terminals. PageGate Platinum includes priority support, training as well as all of the options and interfaces. Easily record and edit audio files to create professional sounding podcasts. Supports MP3, WMA and WAV files. Files can be imported or recorded. Easily remove sound distortions and imperfections with drag and drop editing. Create sound effects, record music or interviews, edit and layer clips to provide commercial quality recordings. Music files can be mixed, cross fades, and transitions can be added. Features include built-in noise filtering prevents sound distortions, volume scaling and a built in ID3 editor for tagging audio files. 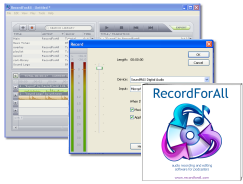 RecordForAll also includes integrated support for podcast feed creation software, making it the perfect choice for podcasters interested in high quality audio recordings.